My recent trip to Maine has got me thinking a lot about lobsters. You can’t go for more than about two minutes up there without encountering a lobster somewhere – either on a roadside sign, a tea towel, a postcard, or – if you’re lucky – in a restaurant. I ate a lot of lobster while I was there. Once it came on a roll, but my preferred method is the old-fashioned way – wearing a silly plastic bib and attacking a freshly-boiled beast with menacing-looking tools with a pot of melted butter to dip the glistening flesh into. Many were happily dispatched this way – in roadside shacks, in actual restaurants, and, most memorably, amidst a multilingual cacophony of Italians, Spanish, Brits and Chileans who all found themselves sitting at the same table. That was an evening that won’t be forgotten any time soon. Not by us, and probably not by the bemused Americans sitting around us, either. But now for the sad bit. I was told last week that lobsters mate for life. I so wanted this to be true, but made the mistake (damn you, cursed internet) of checking my facts before starting this post. And I’m sorry to report that it’s not true at all. Quite the opposite, in fact. Apparently male lobsters are actually rather randy, crustacean Casanovas. This news has saddened me more than it really should. Another illusion shattered. To compensate, here are the Smothers Brothers singing about doomed lobster love. Anyway, all that has prompted me to re-post the following (slightly edited) lobster-related blog which I wrote some years ago and which, I have to confess, I have already re-posted once. Apologies to those loyal readers who have suffered through this before. Perhaps unsurprisingly, given the epicurean delights of last week, now I am sorely tempted to give this another try. This lunatic quest began some time ago as I was reading an amusing piece by a fine writer named Steve Almond about eating lobster pad thai in Maine. As I read, I licked my lips and pictured myself serving up a similarly ravishing masterpiece to a rapturous reception. The fact that I had cooked neither (a) pad thai nor (b) lobster before did not strike me as much of a problem. I could not get the thought of that lobster pad thai out of my head. It just sounded ridiculously delicious – perhaps that stands as testament to Almond’s mouth-watering prose more than anything. The only time I could remember actually eating lobster was my first ever visit to Missouri, just after I was married, when we went to a restaurant at the Lake of the Ozarks and my wife ordered deep-fried battered lobster. (I know, I know. So many jokes, so little time.) I wasn’t even quite sure if I liked lobster or not. That didn’t matter. I knew I had to try this dish. I looked everywhere on the internet for a recipe, but no dice. I knew which book the recipe came from, because Almond had been good enough to name the book, but obviously there was no way I was ever going to fork out twenty bucks for a book for just one damn recipe. Such wanton profligacy was needless, and immoral, and just plain wrong. 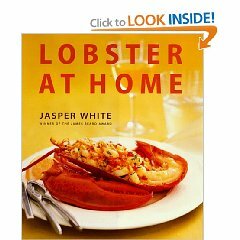 Once the book arrived from amazon, I spent a couple of months contemplating the amounts of lobster required to feed even a modest number of people, debating all the while whether to re-mortgage the house. My wife asked whether I couldn’t just use frozen lobster tail, or perhaps shrimp. These were good, sensible suggestions, and obviously entirely missing the point. I dithered endlessly, until, as the global financial markets went into meltdown all around me, I decided to act. Heroically undertaking to rescue mid-Missouri’s ailing retail economy single-handedly, I went into Schnucks and bought three live lobsters. I hopefully asked Walt, who was working behind the seafood counter that afternoon, whether two might not be enough, but he shook his head and told me I’d need at least three of the little fuckers. (Not his precise words, I should add. They’re very polite in Schnucks.) I drove home fast, trying to outrun my guilt at the ridiculous amount I had paid for my salty, snapping booty in the back seat. The actual cooking of the pad thai was uneventful enough. I’d discovered a new Asian supermarket the previous week and had been led through it by a lady who gabbled away on the telephone in unintelligble dialect as I trailed her around the store, meekly holding up my basket as she threw items into it. I’d chopped and diced and measured and poured everything in advance, and the stir-frying was all over rather quickly in the end. But was it any good? Well, it wasn’t bad. It was quite pad thai-like, I suppose. Everyone made suitably appreciative noises as they slurped on their noodles. But all I could think of was how much I had spent on those tiny bits of lobster meat that flecked the bowl. I know I’m supposed to extrapolate some sort of neat moral aphorism from all this. Nemesis follows hubris? Don’t cook fresh seafood in Missouri? Both valid points. But I’m going with: sometimes you should listen to your wife. Next time – if there is a next time – I’m going to use shrimp. Thanks, Julia! Good point about all the lonely lobsters… hadn’t thought of that. 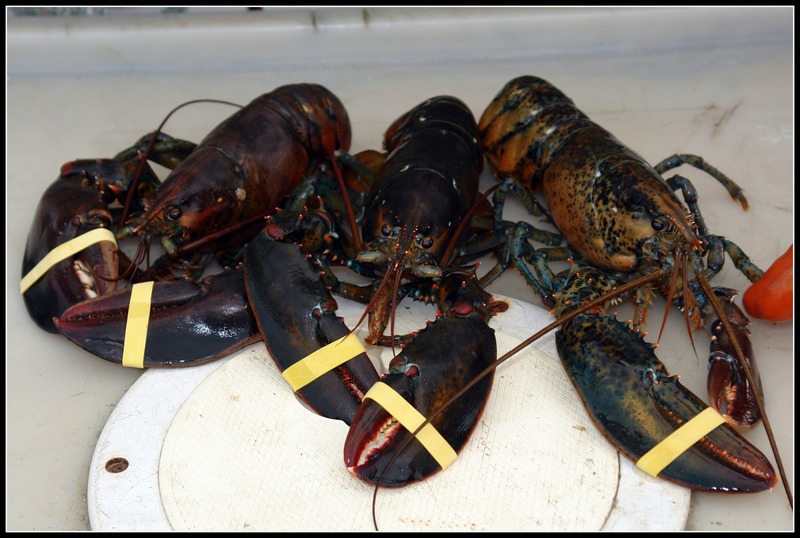 Today I have learned a lot about how cruel it is to boil lobsters while they’re still alive. I was sent a youtube video showing how you can kill a lobster BEFORE you still it in the pot. Will try and do that next time. Am feeling suitably abashed. *SIGH*….you had me at “lobster”…and, what was it? Oh, yes “multilingual cacophony”….the two together would be sheer joy! I’m a huge fan of lobster, but in all the times and all the ways I’ve eaten it, I’ve never done the cooking myself….always left that to the professionals! Steamed, boiled, broiled, Thermidor, crepes, and the infamous roll…none were prepared by me!